Suddenly the snow cleared the sun came out and more than 11,000 runners raced round the inaugural Vitality Big Half which was won by Sir Mo Farah. Fifteen Spartans ran the half marathon which started at Tower Bridge, went round Docklands and finished by the Cutty Sark in Greenwich. ERICA GRAYSON was delighted to run a new personal best (PB) of 1 hour 54 minutes 44 seconds knocking 2 minutes 53 seconds off her previous best. TIM SABAN also ran a PB and is edging ever closer sub 90 minutes with his 1:30:23. MARTIN BLACKBURN, 1:29:12 and STUART HAYCROFT, 1:29:16 were the fastest Spartans while MARK COLLINS also made it into the top 1,000 with his 1:31:30. YUKO GORDON continues to inspire. She beat all the men as well as all the women in her age group with 1:37:55. ELLA GOWER reduced her PB to 2:30:07 and is determined to get rid of those seven seconds very soon. PETE SMITH went round in 1:39:58; BRIAN WHITE in 1:40:42; JIM BROWN 1:50:11 had problems with an old injury on the long cobbled sections but is hopeful he can lose the 12 seconds needed for a good for age qualifying time later this year. JENNIFER NAISBITT ran 2:12:56. GERRY ROSEN admitted he went off too fast and came in at 2:20:22 with KAREN BROOM close behind at 2:20:38. Then came SARAH RUSHWORTH with 2:36:35 and EMMA MARTIN after helping another runner and collecting a great set of event pictures including steel bands, choirs and a competitor on stilts in 3 hours 17 minutes 1 second. 5716 of the 11504 finishers were women, 5788 were men. 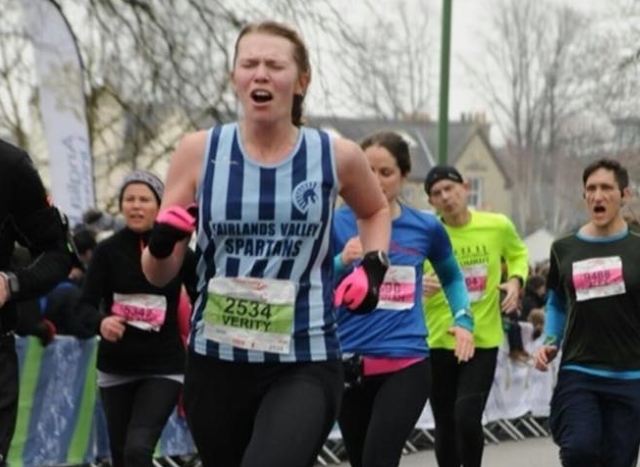 Although the Welwyn Half Marathon was cancelled the thaw came soon enough for the Cambridge Half Marathon to go ahead and VERITY FISHER was smiling after her new personal best of 1 hour 51 minutes 49 seconds. SIMON JACKSON came in fastest Spartan and well in the top hundred with 1 hour 17 minutes 26 seconds and ninth in his category. ASHLEY SCHOENWETTER was fastest female from Fairlands with 1:31:13 and tenth in hers. STEFFAN FORD beat his personal best that was set in 2013 with an excellent 1:18:07 and club women’s champion SUZY HAWKINS ran a new PB of 1:32:46. Daniel Sutton came in with 1:50:45. Marie Colucci and Dawn Easby finished together in 1:55:39. DAVID BOWKER competed for EMAC in the Inter Area Indoor Match at Lee Valley on Sunday. He was fourth in the male 35 plus 2K walk and ran the third leg of the male 50 plus relay team who finished third. EMAC is the Eastern Masters Athletic Club. Several Spartans are members so they can take part in competitions for veterans. With most local parkruns cancelled due to the recent weather conditions only two Spartans made it out to participate in a parkrun this weekend. JOHN ROXBOROUGH and MARK BEASLEY both went to Panshanger, with John finishing 39th male in 23 mins 11 secs and Mark 40th male in 23:16. Maidenhead Easter Ten on Good Friday 30th March. Club training twenty from Marriotts on Friday 30th March. Mid Week Road Race League race one 6 miles in Epping Forest on Thursday 10th May at 7.30p.m. Mid Week Road Race League race two 10K in St. Albans on Thursday 24th May. Mid Week League Race 3 8K in Trent Park on Thursday 7th June. Mid Week League Race 4 in Stevenage on Wednesday 27th June. Mid Week League Mob Match on 12th July. Welwyn Half Marathon on Sunday 9th September (new date).